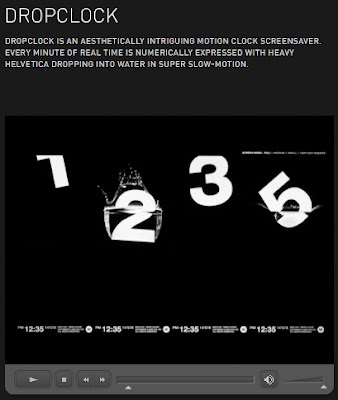 The typeface blog Serif turned me onto the Drop Clock Screensaver, a very cool alternative to hackneyed scrolling messages or awkward photo slide shows. Each minute is marked by the time's numbers (shown in Helvetica) dropping into an inky pool of water. Available for download at SCR's website, it is free!, and thus too cheap to pass up.